Saving the environment is a huge topic today, which makes this reusable coffee cup sleeve the perfect gift for those who care and enjoy their morning coffee at the drive through window. It should fit a standard coffee cup, but if you find you need to adjust the size, you can do so in multiples of two. 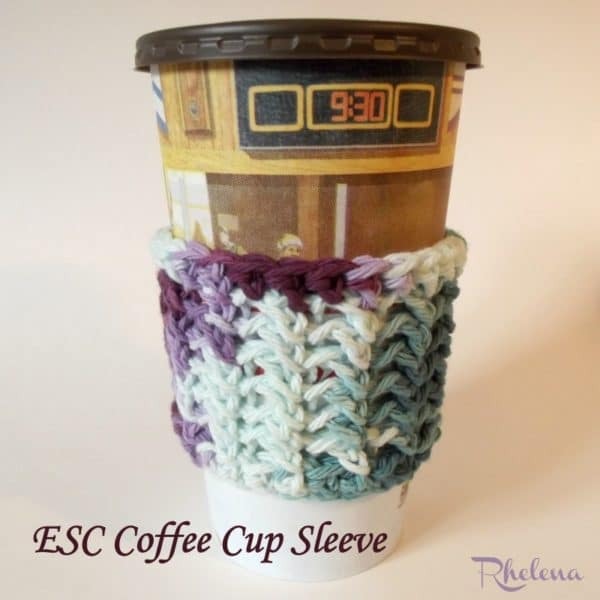 Another cool pattern for on the go is this crochet cup sleeve, which has a thick texture to provide you with extra protection against the heat. And this mug cozy is to enjoy your coffee at home. To ensure that you can reuse this cozy many times over, take care that it does not shrink during washing and drying. Finished Size: Laying flat it measures 4″ across by 3″ high. Fits a standard paper coffee cup. ESC = Insert hook in stitch or chain indicated, yarn over and pull up a loop, yarn over and pull through one loop, yarn over and pull through both loops on hook. When you make your chains, make sure to keep them loose so they remain the same size as the extended single crochet stitches. Ch 28. Join with sl st to first ch being careful not to twist chs. Rnd 3: Ch 1, (esc, ch 1) in first esc and into each esc around; join with sl st in first esc. Do not work into ch-1 spaces. Rnds 4-7: Rep rnd 3. Rnd 8: Ch 1, esc in same st as join and into each st and ch around; join with sl st in first esc. (28 esc) Fasten Off.